Motivation to get more exercise. Is there a better alternative to Get Moving? Is Get Moving really the best app in Health and Fitness category? Will Get Moving work good on macOS 10.13.4? 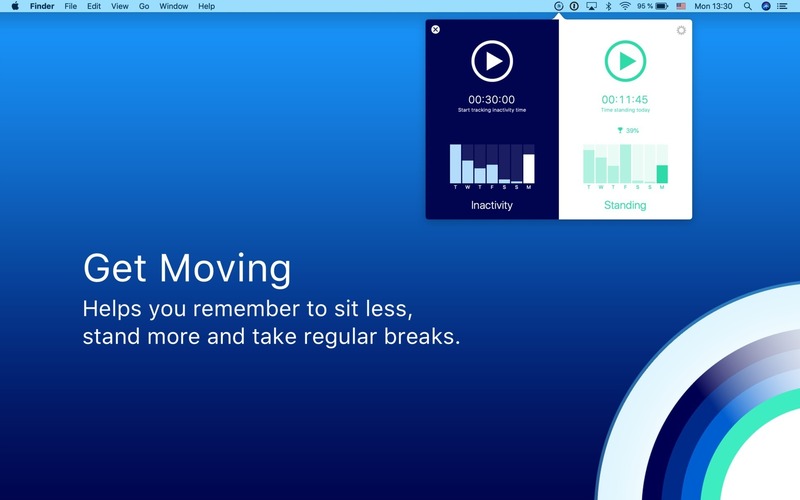 Get Moving motivates you to sit less, stand more, and take a break whenever you have been inactive for too long. 5 minutes - As we all know sitting for prolonged periods of time can have a very negative impact on your health. Aside from proper ergonomics regular breaks are essential. A 5-minute break every 30 minutes can make all the difference. Stand While You Work - To avoid prolonged periods of inactivity you can try alternating between sitting and standing. This is where the standing timer comes in handy. If you are new to the concept of standing while working start by setting a goal of just a few minutes and then gradually increase the amount of time. Dance While You Work - Default alert chime or your own tune? You choose. To motivate you even further you can select your favorite song from your own music library. We are pretty certain some party music is not as easily ignored as a standard alarm sound.